I bought these a few mo months ago for the same price. 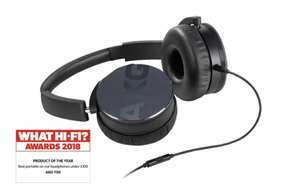 Outstanding headphones and a lot of reviews reported they were the best headphones under £100. I've had these for years now. Great headphones and still going strong! The Bluetooth version is £10 more from Mobilefun. C50BT and Y50BT are …The Bluetooth version is £10 more from Mobilefun. C50BT and Y50BT are actually identical. https://www.mobilefun.co.uk/akg-c50bt-on-ear-wireless-bluetooth-headphones-black-70955?utm_source=google&utm_medium=cpc&utm_campaign=shopping&referer=pla&cur=0&gclid=EAIaIQobChMI5Mim6KPU4QIVV-d3Ch22OAZUEAQYBCABEgLI_fD_BwEVery good headphones. Good spot. £2.19 delivery as well. For £12 far better off getting the BT version - best of both worlds. Is this site trustworthy? Would love the y50s! Yes. Sure I've used them in the past. I've used them too. I bought the headphones from Argos as they had good deals on them for ages but don't seem to stock them anymore, but I can vouch for the headphones being the same model and very good quality. any other hole where Jack could go in? Have the Bluetooth version, got it for around £60 from Argos. Easily worth it, sound quality is what would be expected from headphones even 3x the price even over BT. Only problem I have had is needing to return twice during the 30 days as the earcups became very loose. I'm on the third set now and don't seem to have any more issues with these, though would be very careful and get a warranty for them if possible (I was sold 2 years for £5). I have these. Nice quality product for £50. I'm listening to YT with mine right now. Thanks for this, just picked up the Bluetooth version for £62 - can use wired or wireless so worth it! Have these, great sound but I don't find them particularly comfortable on the ears. After about an hour I have to switch to something else. Also just outside warranty the padding across the top of mine split and the foam came out. So less comfortable now. I have the BT ones and they do sound fantastic and the only small gripe is that the position of the on button and that when you put them in the pouch occasionally they turn themselves on. As above a big problem with these is when they’re folded in the on off button often becomes activated and drains the charge, mine were ok while they lasted but broke after a year when the wire housing broke, wouldn’t buy again. I have the BT ones and they do sound fantastic and the only small gripe is …I have the BT ones and they do sound fantastic and the only small gripe is that the position of the on button and that when you put them in the pouch occasionally they turn themselves on. Agreed. Sound is excellent. On button could be in a better place. Minor gripe against excellent headphones. I have the bluetooth verison, very good headphones, great sound and build quality, would recommend. Love these headphones after the tightness on the ear is broken out. The BT versions are a tenner extra. I'd get the BT versions over the wired ones, they're definitely worth it for the freedom. You're going to struggle to find a better pair of BT headphones for the price. As other's have said the clasp that holds the speakers in breaks easily but it's a pretty easy fix. I just replaced the small screw with a larger one and hot glued it into place.